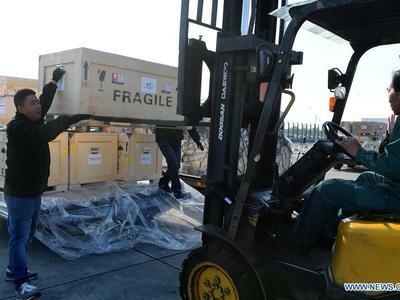 A total of 796 Chinese cultural relics arrived at Beijing International Airport at 6:54 a.m. Wednesday after an eight-hour flight from Italy. The group of Chinese artifacts were first noticed by a unit of Carabinieri, or the national gendarmerie of Italy, on the local relics auction market in 2007, which was followed by a domestic judicial trial. China's National Cultural Heritage Administration immediately contacted its Italian counterpart after hearing the news and started the repatriation of the relics. After over a decade, the Italian court made the final decision to return the 796 artifacts to China. On March 23, China and Italy exchanged related certificates. According to Beijing customs, the recovery is the biggest transfer of cultural and historical artifacts to China in nearly two decades. "As a Chinese, I am so proud to witness the return of these relics after years of effort," said Zhang Yanmin with the Beijing International Airport. China will display the items in Beijing next year as part of a wider plan to celebrate the 50th anniversary of the establishment of diplomatic ties between Italy and China.